Not long after my first child was born, my mom presented me with a box of treasures... dozens of books I had grown up reading (or had read to me). Included in this box were some twenty-odd National Geographic kids' books from the 1970s, old Dr. Seuss, Disney, and other books. One of the interesting and refreshing things about these old books is that they are much harsher and matter-of-fact about the world than today's children's books. They don't sugarcoat that animals eat other animals or that there are bad things that happen in the world. They aren't malevolent, just more honest. Some of them also have messages that are hard to come by nowadays. The box of treasures also included a dozen or so Whitman Tell-a-Tale books. These are quite small -- roughly 6.5 x 5.5 inches, and averaging 20 pages -- and were among my favorites growing up. The Tell-a-Tale books have titles like Eloise and the Old Blue Truck and Mimi: The Merry-Go-Round Cat. Mimi is one of my now nearly 5-year-old daughter's favorite books (she loves cats). 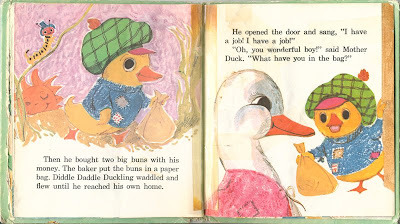 But my favorite as a young boy was Diddle Daddle Duckling by author Grace Irene Bennett, and illustrator June Goldsborough. The copy I have is from 1971, but some quick research tells me that it was first published in 1934. The story follows a young duckling who, finding the cupboard bare, heads out into the world to rectify the situation. The condition of my copy is bad. It's beyond dogeared, and is barely held together by 30-year-old tape that is yellowed and brittle. Just in case, I scanned the entire book, so that it wouldn't be lost forever. Yup, 25 cents is all this book cost in the early 1970s. Note the tape holding the binding together, and the tattered pages peeking out. The book opens with the matter of fact statement that Diddle Daddle and his family were poor. No excuses, no blaming the non-existent father. Diddle Daddle found that the family had no food, grabbed his hat, and set out on the road. When he found Mrs. C. Dog, he asked her for a job. Sadly, her puppies did all of her work for her and she had no job to offer. 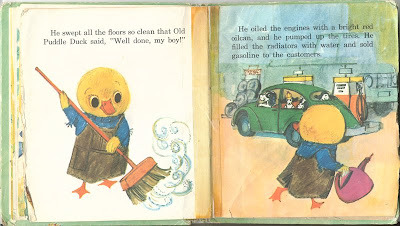 Undeterred, Diddle Daddle continued on to see Mrs. Hen, but found the same result. He sat and thought, and finally had an idea. He stood tall and tried to quack like a big duck, and walked until he found a sign that read "Puddle Duck's Garage." 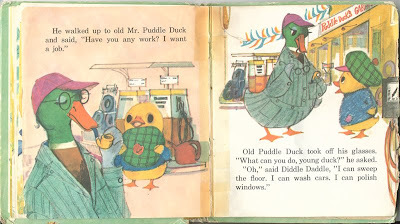 Old Puddle Duck decided to give him a job. Diddle Daddle hung his hat on a nail, put on a leather apron, and set to work. He worked and worked, and at the end of the day, hung the apron on a hook and washed himself off with a hose. Diddle Daddle Duck walked to the bakery with his money and looked at all the chocolate cakes and doughnuts, still fresh and warm. But he had more important goals in mind. "I have a job! I have a job!" he sang to his mother. His brothers and sisters gathered around and Diddle Daddle Duckling and his mother handed out portions of the buns that he had bought with his hard-earned money. When tucking him in that night, his mother said, "I'm proud of you." What a perfect parable extolling the virtues of productive work, honesty, integrity, and pride! He identifies a problem (poverty) and the values the problem is harming (his mother and siblings); he develops a plan (find a job) and works hard to execute it; and he achieves his goals and feels pride because of it. Something in this book spoke to me at a very early age. I wouldn't read Ayn Rand for nearly 15 years after I outgrew Diddle Daddle Duckling, but now I see that I get the same thrill reading about Howard Roark or Hank Rearden as I do when I look back at this story of a little duck. I had forgotten this story until I went through the box my mother saved. I vaguely recalled the book itself and that it had been my favorite, but not what it was about. When I read it again, thirty years later, my jaw dropped at the simple clarity and honesty of the message. This is what children's books should be like. "And Diddle Daddle fell asleep, dreaming of buns and oilcans and watering cans. 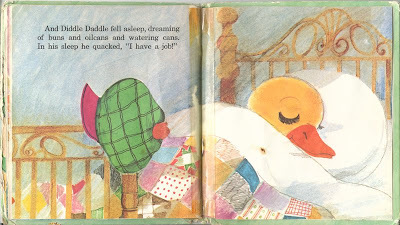 In his sleep he quacked, 'I have a job!'" When I was in third grade, my teacher read The Boxcar Children to the class. I was mesmerized. When she finished and put the book back on the shelf, I got up in the middle of class and went and got it so no one else could get it first. I read it over and over again. If you're not familiar with it, it's the story of four orphaned children, the oldest of whom appears to be about 12, who have nowhere to live, and find an old boxcar which they make into a home for themselves. They exhibit determination, self-reliance, and ingenuity and make a solid life for themselves. There's a bit of Christian-inspired "live a good life and heaven is your reward" implications about the way the story ends, but that doesn't really detract from the virtues of the story. Apparently there is a whole series, of which the book I love is just the first, but I never cared to read the others. A few years ago I found a copy at a school book sale and snapped it up. It had been perhaps 30 years since I'd last read it, and all the wonderful memories and feelings came flooding back. 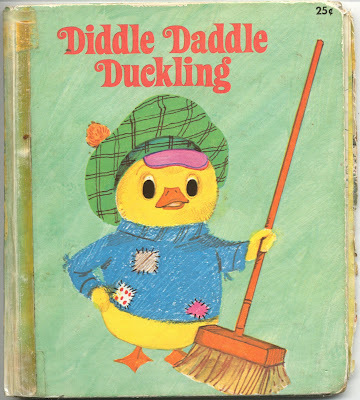 So I know exactly what you mean when you talk about Diddle Daddle Duckling. How wonderful that it's come back to you. I find that praise of hard work and pride in it hardly every shows up in American children's movies. Instead, you get a lot of "you've just got to believe in yourself" which I take to be inspired by the pseudo-self-esteem movement. On the other hand, some Japanese Anime, particularly the ones made by Hayao Miyazaki have strong emphasis on worthiness of hard work: See for example the fantasy Spirited Away and the even better romantic Whisper of the Heart. Oh, how adorable! My favourite children's book is The Digging-est Dog by Al Perkins. I read it over and over until it fell apart. When I was a teacher myself, I brought it to school for Book Week and our lovely librarian repaired it for me! It's lovely to be able to share parts of our childhood with children today. I had never seen this book - I love it. What's interesting to me is that while we might not remember the specifics of a book, we remember a certain excitement that the book inspired: characters working hard to triumph over real adversity will do that. Piz, thanks for the reminder about The Boxcar Children. I read that as a kid too, but had forgotten about it. I'll put it on my list for my kids! Cafe Chick, I'm not familiar with The Digging-est Dog. What makes it special to you? LB, Pickles sounds great, and I know a little almost-5 year old girl who would love it! I think I'll put it on the xmas list. Wonderful. A children's book whose last line brought a literal tear to my eye with its simplicity, beauty and truth. It's stumbling across such gems from the past that really brings home the extent of what Rand called "our cultural value deprivation". Amazing! 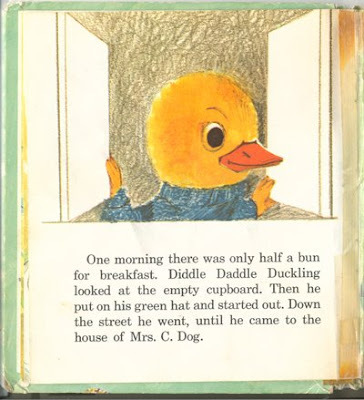 I remember Diddle Daddle Duckling from my childhood, although my favorite book at the time was The Little House. You are right that many children's books were much more matter-of-fact about the realities of the world. Elisheva, you're the first person I've encountered who knows the story too! I would love to see a scanned copy of Mimi the Merry Go Round Cat. I loved that book and have been looking for it for quite a while. I have seen it places like Ebay and amazon used but the prices are so high!!! I found your connection to your love of the story of Diddle Daddle Duckling as a child to your love of Ayn Rand hysterically funny...and absurd. Yeah, Diddle Daddle's story does extol the virtues of productive work, honesty, integrity, and pride. He does identify a problem and the values the problem is harming, develop a plan, work hard to execute it, achieve his goals and feel pride because of it. But why doesn't he ever run into any serious road blocks that prevent him from achieving his goals? Because it's a CHILDREN'S BOOK designed to teach kids the virtue of hard work. And there IS a virtue to hard work, but that doesn't mean that life never unfairly thwarts those who work hard and try to solve their own problems. 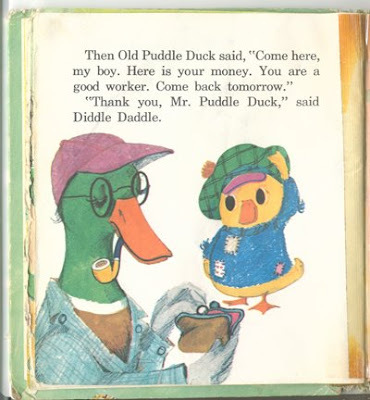 Today, Puddle Duck would probably only employ Diddle Daddle for a short while before finding someone who would help him in the garage for even less than he was paying Diddle Daddle, so he'd find an excuse to lay off or fire Diddle Daddle, and he'd be back to square one. 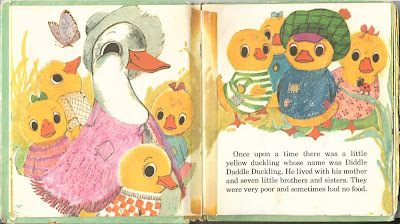 And if he got upset about this, Puddle Duck would accuse him of being just a whiner who blamed his situation on his poverty and his father's abandonment. If he really wanted to remedy his situation, he'd either agree to a salary cut or find a new job! Ah, but Mrs. Dog still has all her kids doing all her work for her, and Mr. Pig has outsourced all his work to China, and Mrs. Cow doesn't want to hire Diddle Daddle because she can get her current staff to do the job he'd otherwise do if she just works them longer hours for the same pay. There is no job left for Diddle Daddle. Oh, and Mimi the Merry-Go-Round Cat? I loved that book too. But really, by Randian standards, wasn't Mimi just a homeless drifting bum looking for a handout? GET A JOB, MIMI!!!!! SLACKER!!!!! So you agree about the virtues of the children's book, but fault either it or the value I place on it because it doesn't also share your cynical view of human nature, and your misunderstanding of Rand, free market capitalism, and the role of voluntary, value for value trade in a free and rights-respecting society. That doesn't make much sense. In addition, you then put forth the same tired old anti-business, malevolent universe view of the rotten rich guy exploiting the worker that has been peddled for centuries by the likes of Rousseau and Marx and their offshoots. Not a very good showing there. Despite the dysfunctionality of the work ethic it continues to be promoted and praised, accepted and acquiesced to. It is one of the least challenged aspects of industrial culture. Yet it is based on myths and fallacies which provide legitimacy for gross social inequalities. If we are to protect the planet and our social health we need to find new ways of judging and valuing each other which are not work and income dependent. I wish I could un-read that, but it is good to be informed about one’s enemy’s mind-set.